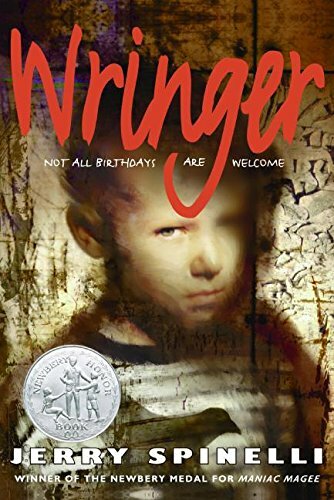 Wringer is strongly reminiscent of What Jamie Saw with the neurotic-to-near-psychotic level of emotional intensity. Though my library had this in the junior fiction section, likely because the librarian didn’t read it enough to look beyond Palmer’s young age, I see why it’s seen as a book for teens. The violence in Palmer’s environment is overwhelming at times and raw. And real, I thought. Kids longing to wring birds’ necks without thought of what they’re actually doing, being downright horrendous to other kids just for kicks. Yep, there’s no nicey-nice here. I loved the Stephen King-like quality of intensity, horrific imagery that’s expressed in plain language, and a sort of Americana neighborhood where boys play together outside. Nowhere do we see an X-box or Nintendo system. Which leaves me with curiosity - there's a confrontation of brutality here that would be interesting to investigate more in-depth.